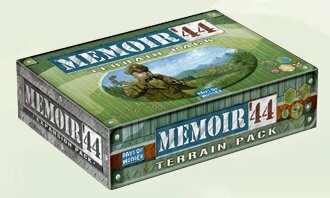 As many of you have discovered, Memoir'44 is more than just a game, it is also a complete and expandable game system in its own right. 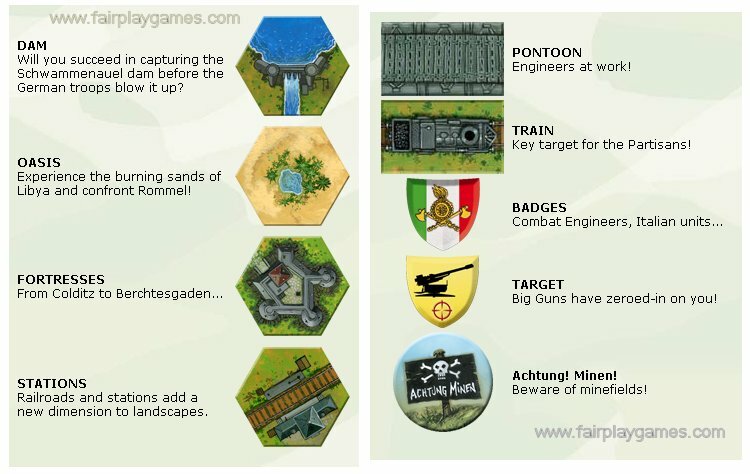 With this in mind, we are pleased to bring you the Memoir'44 Terrain Pack Expansion. Filled to the brim with new terrain pieces, new elite unit badges, and additional victory medals, this expansion also includes dozens of new game elements, including rules for North African warfare, minefields, big gun markers, radar stations, supply depots, airfields and more. 16 obstacles, including pontoons, rail and road bridges, field bunkers. 28 Special Unit badges, including engineers, partisans, North-African and Commonwealth troops, elite US, German,Italian and British units. 4 Historical scenarios showing the main new features. Rules describing these new terrain and game elements. Excellent expansion! This is a "must buy" for any Memoir fan! I use the Terrain Pack in almost every game & have found it to add so much to my other expansions. Kudos to Richard Borg & Days of Wonder! fantastic expansion, so many new awesome terrain tiles. The coolest in my opinion is the train tracks!